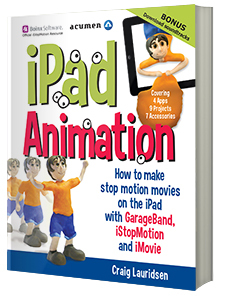 iPad Animation – your interactive guide to making stop motion movies on the iPad. Easy! Boinx iStopMotion – the complete and portable stop motion and time lapse recording studio. Simple! Attend a one day workshop for teachers and learn how to use the iPad for stop motion animation in the classroom. Register now for workshops or invite us to your school. Learning to be a creator in the digital world, not just learning to use systems. From 2018, Digital Technologies is part of the New Zealand Curriculum (dates may vary in other countries). The iPad is one of the most exciting recent developments in stop motion. Now everyone can participate, and with this book you'll soon be making animation movies like a professional. iPad Animation contains more than 275 pages of instruction, tips, examples and flow chart diagrams so you can master stop motion – fast! iPad Animation covers 4 apps (iStopMotion, Garageband, iMovie and djay), 9 stop motion projects and 15 accessories. Includes many inspiring movie and sound examples. Download bonus soundtrack files in both ready-to-use MP3 format and fully editable Garageband files to assist your learning to create awesome soundtracks. iPad Animation is an Official Boinx Software resource. 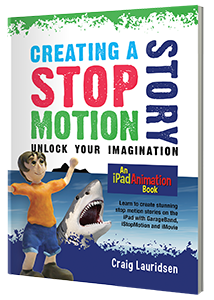 "Overall, the book is a fantastic resource for the stop motion animator. I could easily see this being used in classrooms as a resource or a textbook for a course in stop motion animation. It not only has written text but embedded videos, product links and more. It is easy to read and not just for the animation/tech geek." "This is an excellent resource for teachers that want to incorporate stop motion animation into their curriculum! Lauridsen's book is easy to follow and full of tidbits and resources that veteran animators will find useful!" Want to translate the water cycle into your own language? Participate in the Water Cycle Project. Creating a Stop Motion Story - Unlock your imagination is a straightforward step-by-step guide to creating a story-driven stop motion movie. Ideal for the classroom and hobby. Create a complete movie of an original story in a few hours. Full colour, 56 pages, 3 apps, one iPad, 100% creativity. Bored of playing games and surfing the net on your iPad. iPad Animation will help turn your iPad into a powerful creativity station. Stop motion has strong potential for curriculum objectives. Click here for references to the New Zealand curriculum. Supporting and facilitating a future Steven Spielberg or Walt Disney (both had dyslexia) to make sense of their learning. Click here for information about Professional Development workshops for teachers. 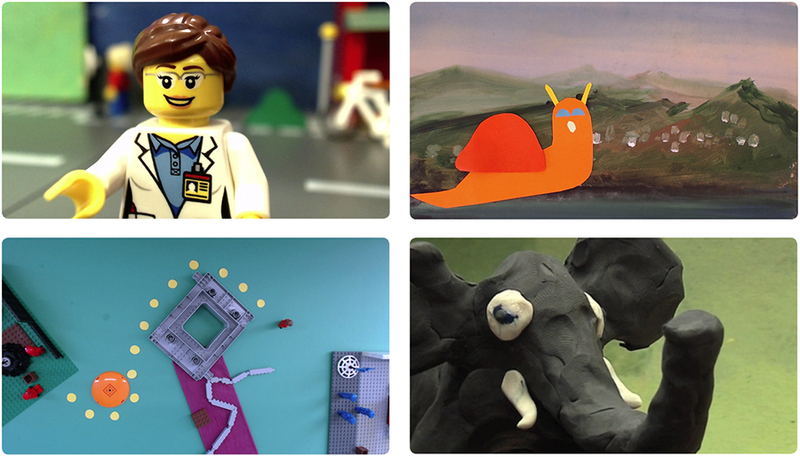 Check out these links for inspiration from other people creating stop motion, with children. 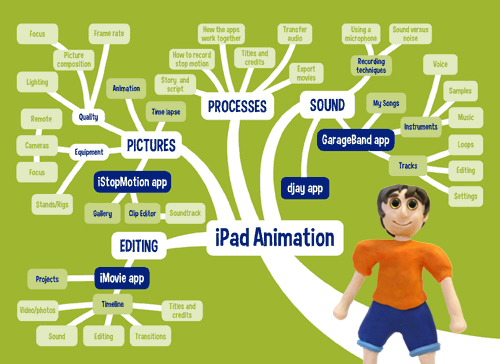 iPad Animation features a mindmap index in each chapter, making it super easy to navigate and choose your next topic. iPad Animation shows you how to develop a three-part story in as little as seven sentences. Great for improvisation and group work. Every movie – whether fiction or nonfiction – needs to have something to say. A compelling &apos;story&apos; will draw an audience into your stop motion movie. Your story doesn&apos;t always need words, but it should show a progression of ideas in a way that captures the audience. Stop motion movies are a powerful medium. Life is too short to make a bad stop motion. iPad Animation shows you how to use iStopMotion, Garageband, iMovie and djay together. The book features easy–to–read diagrams showing how each app works with the others. Make your stop motion film visually stunning! iPad Animation explains how to maximise picture composition, lighting, and camera settings. It also provides techniques you can use to keep your camera steady. Hollywood movies show us that nothing is truly impossible. Superheroes have extraordinary abilities and defy the laws of nature. iPad Animation shows you how to create special effects in your own stop motion movies using camera angles, camera movement and a little creativity. Your audiences will be mystified in no time. iPad Animation equips you to create amazing music and sounds for your movie soundtrack. Turn your moving pictures into powerful and dramatic cinematic adventures and your movie masterpiece can become the blockbuster epic. Learn to use GarageBand and djay to record dialogue, make music and sample your own sound effects, and send your soundtrack directly to iStopMotion or iMovie. If you&apos;re making your own movies it doesn&apos;t really make sense to steal someone elses music to make your pictures look good. With GarageBand you've got an immensely capable sound machine in your hands. Even if you call yourself a non-musician we&apos;ll show you how to create some pretty good sounds. And if you have some musical ability you'll be able to produce truely amazing sounds. When you register iPad Animation you get access links to download the original unlocked iPad GarageBand and MP3 files used in the projects. Get off to a really good start in GarageBand by adapting these professional soundtrack templates for your own stop motion. Not only will you get the soundtrack files used in the book, you'll also get an additional 15 BONUS soundtracks in GarageBand and MP3 formats. All our soundtracks have been created entirely on the iPad by songwriter Theo Corfiatis (Blue Xrysalis). To help you create the best stop motion movies we've put together a summary of some of the best and most affordable Audio Resources on the internet. Go Girl - a crazy story about a plasticine girl and a hungry butterfly. Race Day - Fast and Furious with Lego. This stop motion has 24 camera angles in 37 seconds. Stick Insect - using time lapse to view an insect 12 times faster than normal. Many more movies inside the book. Copyright © 2017 Acumen. All rights reserved.